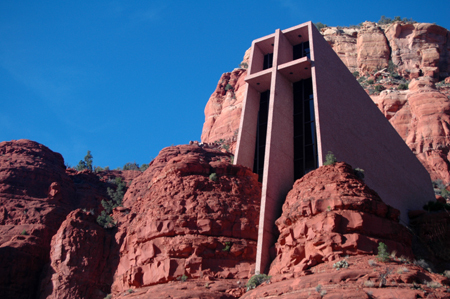 In my last post I shared with you some photos of the beautiful National Cathedral in Washington, D.C.
Today, it’s something from the other end of the spectrum…an architecturally modern and equally stunning church…the Chapel of the Holy Cross in Sedona, Arizona. Sitting on top of 200 feet of rock, it can be seen from quite a distance (there’s an area with some hiking trails a few miles to the south from which it’s clearly visible). Located seven miles south of the city and nestled within a residential neighborhood, the surrounding area looked a lot different when the structure was constructed back in the mid-1950s. There was literally nothing but open land as far as the eye could see. The story behind the Chapel is interesting. The Cliff Notes version is this: a woman by the name of Marguerite Brunswig Staude first conceived of it in the early 1930s while she was an art student in New York City. After she and her husband purchased a ranch in Sedona in 1941, Staude felt she’d found the right location for the project – which was really quite amazing when you consider that Sedona at that time was essentially a one-intersection town. A site was selected, permits secured, and the church was completed less than two years after ground was broken in 1955. This was quite a feat given the considerable construction challenges. The site was literally in the middle of nowhere: there was no road to it, and there was no electricity or water. Everything had to be hauled in. In order to disturb the area as little as possible, a significant portion of the excavation was done “by hand,” so to speak. Workers carefully chipped away at the solid rock – removing some 25 tons of it in this manner. Then there were the significant temperature changes common to the area – which posed challenges with both the concrete (due to the cold) and plate glass windows (heat). And so on. But persevere they did…and the result is quite stunning. If you’re in Sedona, be sure to check it out.